Every Day is an Umbrella Funday! Why wait till Black Friday or Cyber Monday to go shopping when everyday is an Umbrella Funday! Every year, it seems like people are shopping earlier and earlier to get ready for the holiday season. Stores get prepared months in advance and people mark their calendars for one of the biggest shopping days of the year - commonly known as Black Friday. Then after people rest for the weekend, they get prepared for Cyber Monday. Can you believe that Cyber Monday matches and sometimes outsells store purchases? It has become so much easier for people to sit at home and click on a button than to go out to a store when you can get the item you want for practically the same price. Here at Umbrellas.com though, you don't have to wait for Black Friday and Cyber Monday to find some of the best deals around. We sell affordable, durable and stylish umbrellas that are great for every member of the family all year round. Have an art lover in the family? 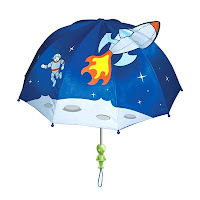 Check out some of our art themed umbrellas. We have everything from Renoir to Van Gogh to Monet. 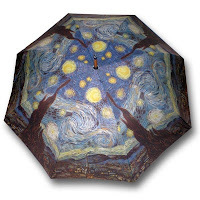 Starry Night is one of our best selling art umbrellas. Van Gogh created this piece in 1889 and it has been reproduced onto numerous items and objects, including our umbrella! Now you won't have to go to a museum to see it, instead just look up when it's raining. 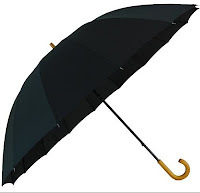 You can never go wrong with a classic and simple black umbrella. It goes with everything! Our doorman is an extremely durable 16 panel black umbrella. 16 panels! It will keep you shielded from the rain and will resist the wind so that it doesn't flip on you at the worst possible time. Nothing is worse than having an umbrella flip up on you. And who can forget the kids this holiday season? We have a plethora of kids umbrellas for both boys and girls! From frilly pink umbrellas to 3D dragon umbrellas, we will definitely have an umbrella that would impress any child.